I’ve never been a speedy runner, I’ve never found running easy and I spend most of my time while running looking at people’s backs in the distance but, I plod on. I try to ignore my frustration at being so slow and rejoyce the fact that a few years ago I couldn’t plod anywhere. Lately though, I’ve been in a deep running rut and my interest in the activity as a whole has been minimal. I ran an extremely difficult half marathon a month ago, it took me 3 hours, I was 4th from last and I hated it. I hadn’t been motivated to train and I didn’t run once in the last 16 days leading up to the event. I wasn’t fit for a 5k never mind a half marathon and I started to think, what’s the point in it, I’m rubbish at running anyway. Since then, I’ve had several difficult ,uncomfortable short runs that my heart hasn’t been in. I haven’t finished a run feeling great for I don’t know how long. So, with little reward of late I started giving little effort, hence my rut. When I signed up to a 5.3km running event called Run 530 which started at 5.30am, I imagined running through my home town bathed in the golden light of sunrise. I had thoughts of birds singing, the first sounds of the city waking up as shops opened and the first buses crawled out of town on a glorious summer morning. Run 530 originated in Italy and is hosted by Perfect Motionhere in the UK. Looking at the 530 gallery I was seduced by sunrise pictures of happy Italian runners in Venice, Modena and Rome. I did not get that! This morning, my alarm went of at 4.15 am, it was raining. I left my house at 4.45am, it was raining. 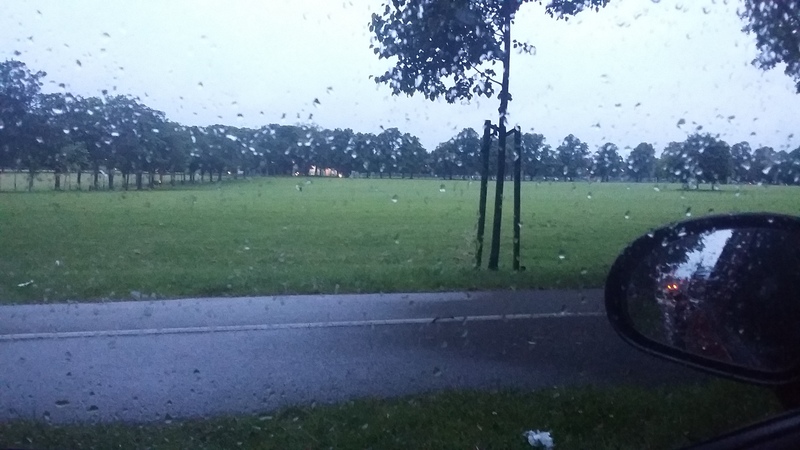 I walked to the meeting point in Victoria Park Leicester, it was raining. There’s a pattern forming here. How wonderfully British the weather decided to be. On the walk from the car I started making preemptive excuses for my impending, poor performance and talking about being the last over the line. To my surprise, and delight as I wan’t feeling very motivated, my super fast runner friend said she’d go my pace to help me. At the start line we were greeted by lots of smiling faces, most in disbelief that they had managed to get out of bed before 5 am for this event. 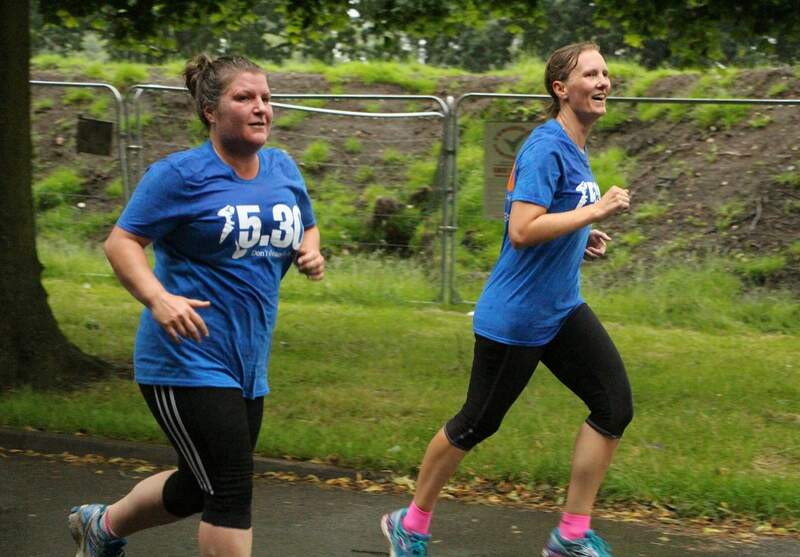 Everyone at a 530 run wears a tour t shirt which can be collected before the event and were coincidentally in Leicester blue this year, a possible connection with Ranieri being Italian and the LCFC premiership win perhaps? Instantly, it was clear that the atmosphere was friendly, inclusive and non competitive. There were no race numbers, no times, no start gun and no pacers. There were cheers and laughs at the start line mostly relating to the weather and time of day and lots of chatter all the way round. The 5.3k route took us past Leicester landmarks such as New Walk (down was much nicer than up), the clock tower, Leicester Cathedral and the Highcross. The rain didn’t matter one bit and despite going a bit quicker than I would if I was on my own I started enjoying it, an unusual occurrence lately. The route was well staffed by marshals and a photographer on a bike who kept popping up in different locations, clear signage meant nobody went off track and when we made it up New Walk there was a lady waiting to give us our lush medals followed by drinks, fruit bowls and a pink goodie bag – hoorah! The goodie bag may have been a bit girly, one man said he was going to wear his fake eye lashes to work that morning but, for me it was a nice change from a healthy chew bar tasting of soil. I finished with a big grin on my face for the first time in a while. I put a bit of extra effort in (mainly thanks to my girl coach for staying with me and the novelty of the event) and got a lot out of this run. Maybe that’s where I’ve been going wrong lately, I guess to get the runner’s reward, you have to actually try and something about today’s event got me to try again. I feel motivated to get back to it now. I really enjoyed this event, it felt like we were co conspirators in a secret club nobody knew about because the city was mostly asleep, I imagine some people were lying in bed with windows open wondering what the noise was as 160 pairs of feet padded through the silence of town at 5.30am. I really hope Run 530 returns next year. Participants are encouraged to run or walk the route so it’s definitely an event for anyone of any experience and ability. Leave your ego at home, this event is all about community, people and fun. Perhaps it’s just a post 530 high but, I’m now thinking of becoming a Run 530 tourist and doing them in Italy next year. I can see it now, ‘Report From the Road with Surfabella, On Tour in Italy’, wonder if there’s a job going that fits that description?